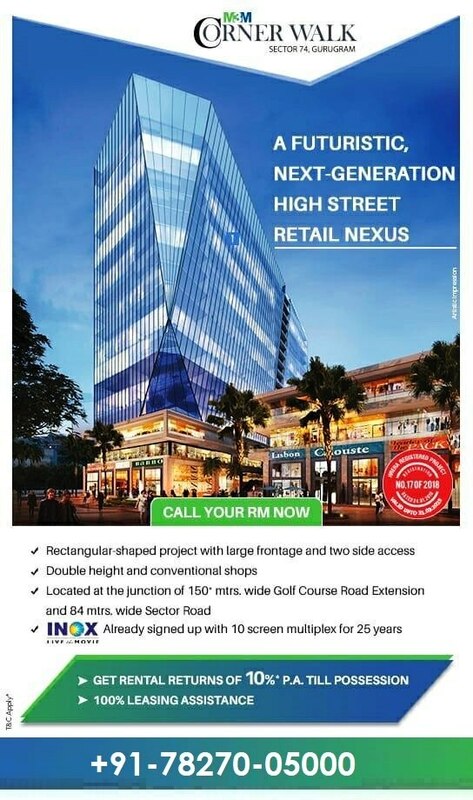 M3M CORNER WALK GURGAON, M3M SECTOR 74, GURGAON, CORNER WALK GURGAON, HIGH STREET RETAIL OUTLET IN GURGAON, LUXURIOUS DOUBLE HEIGHT SHOPS, RECTANGULAR SHAPED PROJECT WITH LARGE FRONTAGE & TWO SIDE ACCESS, LOCATED AT THE JUNCTION OF GOLF COURSE EXTN. ROAD, SPR ROAD GURGAON PROJECT, Looking for Commercial Projects for Investment Purpose ??? Here is Best Project starting in Haryana prime city in Gurgaon M3M Corner Walk- New Commercial High Street Launch in Sector 74 Gurgaon - Assured Rental Return upto 11% per annum with Bank Loan Subvention Scheme M3M India Launch M3M Corner Walk new Mega Launch 7.5 Acres High-street Retail with Multiplex on Main SPR road (150 Mtrs), sector 74 Gurgaon, Its Offer Easy Connectivity from NH8 & Golf Course Extn Road. ​M3M Corner Walk, A place where nights are as happening as days and where one gets the best of living, pubbing, shopping, fashion, dining, outdoor adventure and entertainment. Inspired by lifestyle from different cultures comes a paradise that offers a richly diverse mix of living, shopping and leisure activities. Easy accessibility to the best of fashion, retail and F& B with the fun and frolic of international high-street shopping. M3M India new commercial project of High Street Retail Shops, Food Court & Multiplex is located in Sector-74 Gurgaon on Main Southern Peripheral Road (SPR) banging nearby Nh-8 (New Delhi-Jaipur) highway. The Habitat around this project is close to 50000 family with BMW Training Centre, High end premium schools with Office spaces, Corporate Houses, MNC's, Sohna Road High end townships, Retail Destinations Corner Walk-, a futuristic and an international mixed use style development comprising of Retail Shop, Food Court, Office Space, Studio Apartments – a living concept millennium city has never witnessed before. M3M Corner Walk Lease Assurance Upto 11% Assured Rental Return on all payment plans Very lucrative & flexible payment plans offered with Bank Loan Subvention Scheme 50000 families in the vicinity Surrounded by DLF Alameda, DLF Commercial, hospitals The frontage to host the world’s best brands with high visibility Efficiently designed floor plans Entirely pedestrianized plazas/open spaces around the retail outlets Dedicated branding signage for every retail outlet Boulevards/open spaces to ensure clear visibility Wide display area to showcase latest collection on the go Corner Walk Commercial Configuration- 1.75 acres Front with 60 mtrs wide Road Corner Lower Ground / upper ground / First floor dedicated to High-street retail Second floor dedicated to food court / restaurant / multiplex Third Floor Onwards Offices / Studio Appt Almost Triple height and conventional retail showroom shops M3M COMMERCIAL PROJECT GOING TO BE THE BEST OPPORTUNITY FOR PEOPLE WHO ARE SEEKING INVEST WITH ASSURED RENTAL RETURN & BANK SUBVENTION SCHEME IN RETAIL COMMERCIAL HUB OF GURUGRAM. INVESTORS WILL GET AN AMAZING KICK-START IN THE PROFESSIONAL AREA BY INVESTING IN THIS PROJECT.